Just Kare Senior In Home Care Services is always seeking caring professionals to help us help our elders and disabled in the community. We understand and appreciate that it takes special people to help take care of those who need us now. If you have a caring heart, loving personality and enjoy helping others, we need to hear from you. Retired and elderly caregivers are encouraged to apply. As a member of our team of care providers, you’ll enjoy flexible hours, clean working environments and bonus holiday pay. Go ahead, give us a call or apply online! 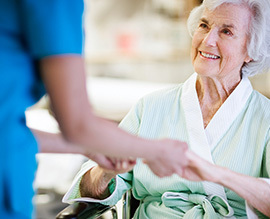 As our care provider you will be placed in a clean and respectable environment. Our care provider will assist with various housekeeping tasks such as meal planning, preparation and companionship activities for elders or disabled in their own homes or residences. Performs homemaking activities which include (but are not limited to): vacuuming, dusting, sweeping or mopping floors, doing dishes, changing bed linens, doing laundry and cleaning bathrooms. Prepares meals and snacks according to instructions. May shop for groceries. Provides companionship for the client. This includes accompanying client on walks, trips to social/recreational activities, assistance with hobbies, etc. High school graduate or G.E.D certificate preferred. Ability to read, write, speak and understand English as needed for the job. Bilingual a plus. Possess a valid Pennsylvania driver’s license, 2 year PA residency and have use of an insured automobile. Apply online now by filling out the employment form below. Do you have a Pennsylvania Driver's License?